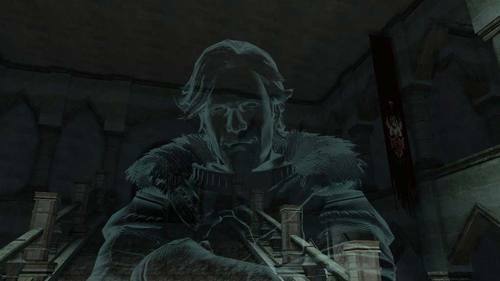 The ghost of the former Chancellor of Drangleic, one of King Vendrick's most trusted confidants. Wellager was an honorable man and a loyal servant of his Kingdom, but appears to have fallen victim to the widespread chaos left in the wake of his lord's disappearance and is not even aware of his own death. The sad state in which he is first encountered raises suspicions of foul play and leaves more questions about the plight of Drangleic than answers; yet even in death the Chancellor is cordial and hospitable towards his guests and will endeavor to make you feel welcome at the castle. "Many castle servants and the like have come to fetch their lord. But they rest here now, put to death by the King's own guards." 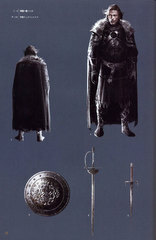 Whatever the reason, his spirit remains fixed to Drangleic Castle. His Highness… Where has he gone?" "You are a guest of our castle. I am the Chancellor, Wellager. The Queen… Has taken him…"
King Vendrick…We must fight back… Or the Giants will take Drangleic…"
"The King had a dear Queen, a woman of unparalleled beauty. The King crossed the ocean… And defeated the Giants, with the Queen at his side." "The King commandeered their power… And created the Golems. To celebrate victory… And to show his love, his gratitude to his Queen…"
"The Queen… Brought peace… to this land, and to her King. "Is this… some sort of a dream? And by whose permission do you stand before me?" Tell me if you should require anything." Be safe on your travels…"
"Where has His Royal Highness gone…"
"The King of Giants… How did you slay that behemoth? Armor reinforced with rare geisteel. Belonged to Chancellor Wellager. Quality equipment that is both light and strong. Crafted by the castle's resident master smith Llewellyn, and supplied only to a select few. His work easily identified by its lack of ostentation, Llewellyn focused solely on an economy of simplicity and strength.